You can teach your kids skills like how to launch and keep it up in the air. The kites are lightweight,durable and sewn with strong construction. The string is a Flat Line Winder, comfortable and easy to grip for adults and children. Every kite gives unlimited hours of fun,priceless moments and great adventure for both kids and adults. Kite flying outside is a great fun for all age,both boys or girls. Kite need skill,practice and the correct wind conditions to fly.Please read the following instructions and warnings. Step 1.Unfold your awesome new kite!You'll find 4 rods inside. Step 2.Attach the spine rods.At the end of the longer rod you have a silver tube and the opposite end has arubber cap. The shorter rod also has a rubber cap at one end.Attach the longer rod and the shorter to create the spine of your kite. Be sure to insert the longer rod through the fabric piping to keep it safe ans stable. Step 4.Flip kite over and attach kite line to the eyelet on the front at the kite. 1.untie the bridle line near the octopus head ,as well as the rope on tail. 2.Tie up the bridle line on the octopus head and the plate. 1.Use far away from those places with high voltage wires,pools,roads and vehicles. 2.Choose a wider field with no trees or high bulidings. 3.Children should be in adult's care and instruction to fly the kite. 4.Suitable for children over 3 years old. 5.Don't fly when it is lightning storm. 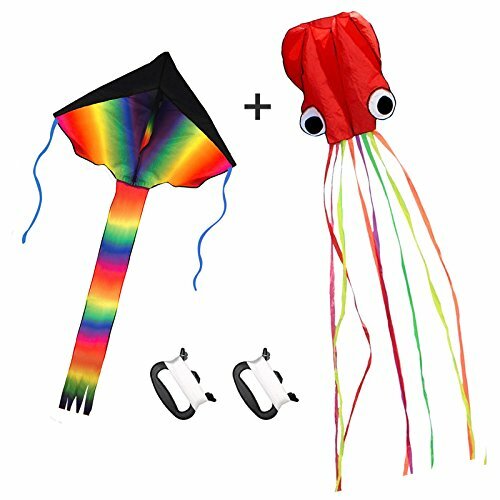 It come with 2 pack of kite,a large rainbow delta kite and red mollusc octopus with long colorful tail,100 meters kite string and easy-grip handle. The kite are made of nylon fabric and strong and flexible fiberglass rods,easy to assemble and simple to launch.2 different pattern design,bright color and stylish appearance will be more attractive to others. Flying the kite in the park or on the beach take a vocation on the beach with your family to spending a pleasant and meaningful holiday,leave some precious memories.. It will be a great gift to kids that it not only to make your children fun,enjoy them time,but also kids develop coordination and critical thinking skills in games. The rainbow kite is a perfect game toy for kids,teen and adult,boys and girls to outdoors activities or take on a beach trip. If you have any questions about this product by Listenman, contact us by completing and submitting the form below. If you are looking for a specif part number, please include it with your message.